Coming to church for spiritual sustenance can be like going to a restaurant for meals. It's all prepared for you and served to you by someone else. A far better way to get your spiritual nourishment is to learn how to get the "ingredients" and prepare the "meals" for yourself. 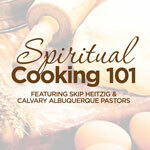 In this series, Skip Heitzig and the Calvary pastoral staff teach how to study the Bible on your own and apply it--how to really "feast on the Word" and satisfy the deepest needs of your heart. Interpretation: The Art of Asking, "What?"